TapaBar will close on January 1, 2018 and beginning January 2, 2018, BFRG will operate a Pop Up Lab for lunch and dinner in the space. This will allow the brothers to ascertain what the right next step for the restaurant space will be – they anticipate reopening the space in a couple of months as a more family-friendly dining destination. BFRG welcomes diner feedback as they test new concepts at the Pop Up Lab. Currently, Chef Alonso Roche is experimenting with Pho as a pop up lunch option in the space. “Alvaro and I are Pho fanatics, and we figured there was no better way to utilize this great space during the cold winter months than by sharing one of our favorite comfort foods with our neighborhood,“ said Chef Alonso Roche. The Roche brothers do not believe TapaBar will be gone for long, the restaurant was a passion project for them both and they would like to revive. 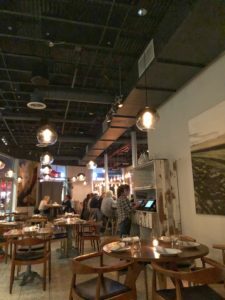 “We are checking out locations around the DC area, if we find the right space, we will be very excited to open TapaBar again in a new location,” said BFRG Co-Founder Alvaro Roche. But do read on if you want to know what I got for Hanukkah this year! What do you want for Hanukkah? Every year, it’s the same thing in my family. I ask my kids, who are now both married, for gift ideas. They do the same for my husband and me. It usually means there are few disappointments, but it also takes away some of the fun of gift-giving. There’s something to be said for surprises, although my need for control is probably why I’m not often on the receiving end of an unplanned present. The same can be said for dining. My blog profile reads: Dining out is my passion, and often times the culmination of hours of research. Still, it can be deeply satisfying when I eat somewhere, and truly enjoy, a restaurant that isn’t high alert on my radar. TapaBar in Bethesda is a case in point. The Spanish restaurant is located at the corner of Fairmont and Woodmont Avenues. Brothers Alonso and Alvaro Roche co-own TapaBar, with Alonso serving as chef. Both have lived and worked in Spain. The duo also own Bold Bite next door, and the relatively new 202 Donuts. I’m aware that positive reviews for TapaBar have appeared in both The Washington Post and Bethesda Magazine, but I have done little more than take note of the headlines. So, as I enter TapaBar, I’m not prepared for the decor. It’s a mish-mosh of rustic meets industrial meets Danish modern meets European garden. Oh yes, Spain makes an appearance here too. What could be a jarring jumble of styles, is actually quite charming. We snag a seat on a banquette in the back of the room. 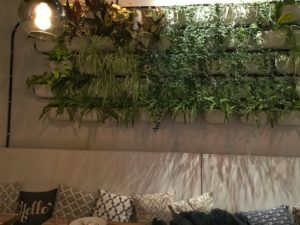 It’s scattered with comfy cushions, and stationed beneath a lovely back wall covered with live plants. 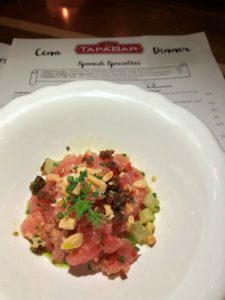 Not surprising, the menu at TapaBar features typical Spanish tapas. There is Tortilla Espanola -Spanish omelette- and Patatas Bravas, which I consider to be a mandatory dish at any tapas outing. 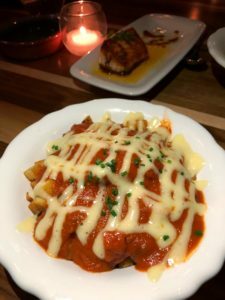 I like the version here- crispy potatoes coated with a warm blanket of chunky tomato sauce, and aioli criss-crossed across the top. Salmon a la plancha is a pleasing wedge of seared fish, dressed in a spicy red pepper sauce. Brussel sprouts and cauliflower each make a respectable appearance, with the former dressed in romesco sauce and the latter roasted, pureed, and seasoned with smoked Spanish paprika. Tartare de Atun is where things get more interesting. Ahi tuna is spruced up with dried figs, diced apples, marcona almonds, and truffle vinaigrette. It’s tart and refreshing, and my only quibble is that I want more. Small plates at TapaBar sometimes translate to really small. 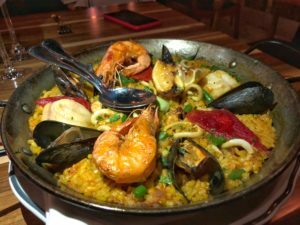 Paella de Mariscos features a generous mixture of glistening shrimp, monkfish, squid, and mussels tossed in green aioli. The dish looks appealing but it lacks oomph, and my enthusiasm is temporarily dampened. But then a small table is set before us, linens spread across the top, and servers commence to unwrap branzino al papillote. 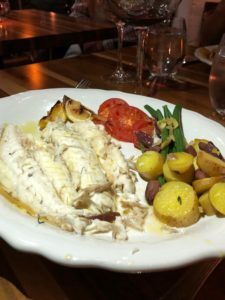 They ceremoniously spoon tomatoes, lemons, and haricot vert across one side of the plate, and then fill the other with fillets of steaming, gleaming branzino. The dish is a smashing success, simple but delicious. It’s at the high end of the $20-$29 range of entrees here, and well worth it. 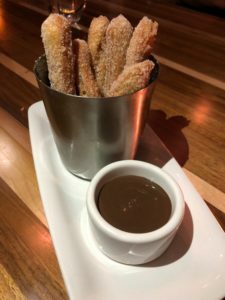 A Spanish meal is best concluded with a round of warm churros. There’s a reason that the Roche brothers opened a donut shop next door. Chef Alonso has a soft spot for sweets, and as diners we owe it to him to share in his delight. I wrote the intro to this post at the beginning of Hanukkah, before the commencement of our family gift-giving. My husband ended up surprising me with the Amazon Echo Dot, which responds to commands and answers some of your burning questions. My first inquiry: “Alexa, give me a restaurant recommendation.” One of the responses she offers is the nearby Sweet Frog, so I’m not sure I trust her taste. I’m no Alexa, but I heartily recommend TapaBar as a Bethesda stand-out. May your holidays be filled with happy surprises.